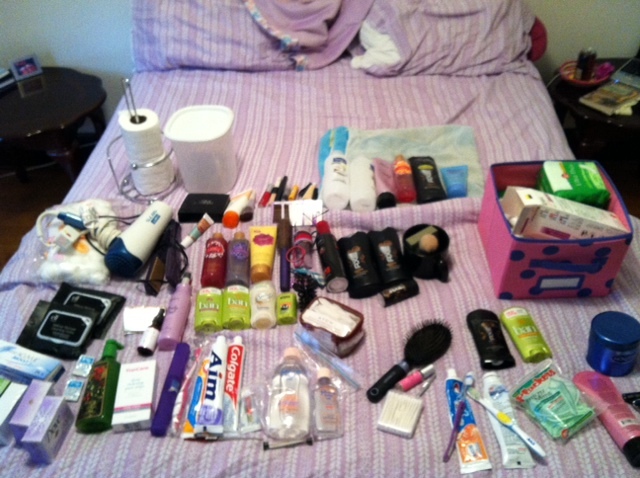 Hi, I’m Caitlin, and I am a recovered Just-In-Case-A-Holic. I took the opportunity to remove everything from my bathroom while I was cleaning it, so I could take an honest look at what I had. My findings astounded me. How about those four brand-new deodorants? The two packs of makeup remover cloths when I hardly wear any makeup? Four bars of soap that came with me when I moved out of my ex-husband’s apartment. Two brand new bottles of body wash for my boyfriend, two for me, plus one for each of us that was in the shower? Five tubes of toothpaste? I quickly began to sort, based on what I would keep, what I would transfer to someone else or to the donate box, and what I could toss. Tossing was easy — old cosmetics and a hairbrush. The transfer/donate pile got the his & hers body washes, lotion, one of those bottles of baby oil, and some other odds and ends (like my two extra pairs of tweezers). Much better. I also left out the kitty litter scoop and toilet bowl brush. Those are givens. Plus, I didn’t want them on my bed. The clear tote box is my “refill” box, with deodorants, soaps, contact lenses, and toothpaste. I vow to not buy any more of those things until I use up what’s in this box. Purple box has the overflow that I use semi-regularly but doesn’t fit in the bathroom, so it stays on my bedroom shelf — it has a hairdryer, flat iron, cotton balls, and various hair and makeup odds and ends in the zip bag. Pink polka dot box has lady stuff in it. The white-lid container is for kitty litter (the litter box is in the bathroom), and the small cup is a shaving kit I got as a gift for my boyfriend. Daily things — dental hygiene stuff, face stuff, hairbrush. Shower stuff — his & hers body washes (to be replaced with a single bar of soap upon their demise), shampoo and conditioner, face wash, shaving cream. 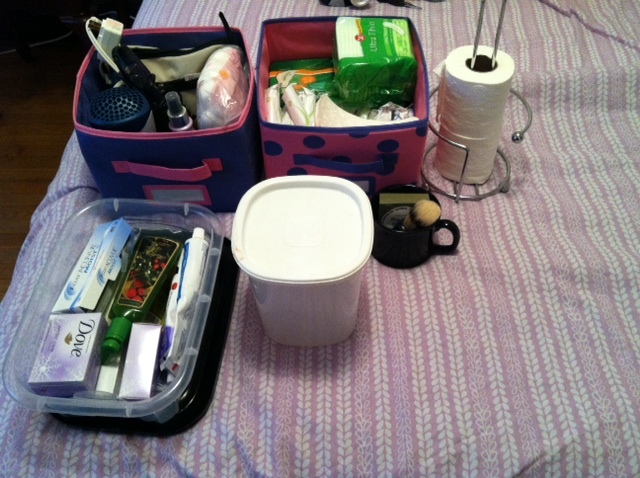 In the vanity — refills, lady stuff, kitty litter stuff, extra toilet paper, and cleaning stuff. One more step toward just enough. I would like to be rid of the excess soaps and toothpastes before I move again, so I’ll be sure to work my way through this stash before I go buying anything new. I love how clean and light my bathroom is when I don’t have clutter all over it. 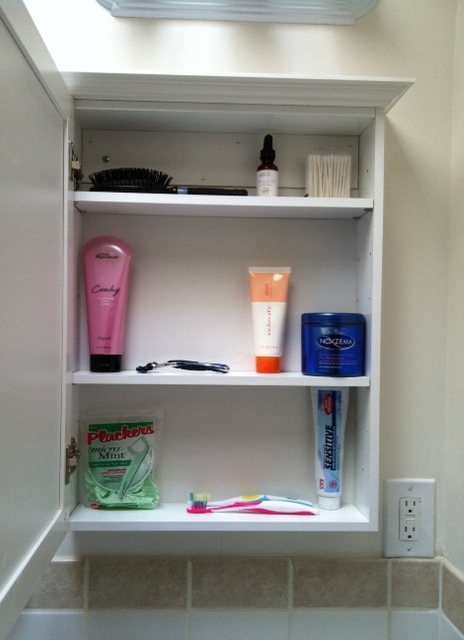 How do you keep your bathroom free of clutter and just-in-case items? I struggle here a tiny bit, because as much as I love trying to be a minimalist, I love saving money even more. So when there is something that I know I’ll use (razors, deodorant, soap, etc) if it’s on sale and/or I have a coupon I stock up. Within reason, of course, I don’t have 50 bars of soap in my bathroom. The other day, I had coupon for the razors I use that were already on sale. Did I already have a pack of razors at home? Yes. But for me, in my current financial state, it’s silly to NOT buy the items that I know that I will use just for the sake of maintaining a minimalist bathroom because then when I need these items I won’t be able to get them at such a discount. I am reasonable in that since I started embracing minimalism I greatly pared down my makeup items since makeup is something I usually only wear for an evening out with friends or a special occasion, and not every day. I no longer have a half dozen pairs of tweezers and nail clippers. Overall, though, my version of minimalism is also trying to be a minimalist with how much money I spend and if that sometimes means maintaining a not-so-minimalist stock of toilet paper or feminine hygiene items, so be it! I hear you! I’m big on coupons and discounts as well. I’ve been known to stock up on stuff, but I’m trying to use up the reserves. Thanks for commenting! Do you not have things such as Tylenol, medicines, and a first aid kit? That’s where most of my bathroom stuff comes from. You did a good job paring down though! I keep first aid stuff in a storage bin in my front closet. I usually keep such things in a bathroom but there is so little storage in this one! 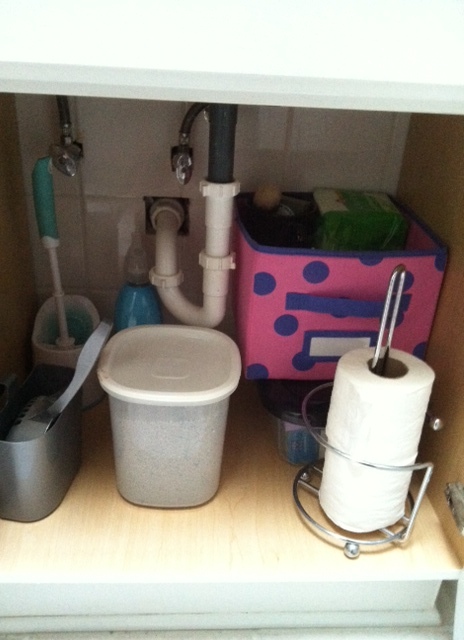 Under our sink we keep only the plunger and toilet brush. Our cleaning supplies are all kept in the laundry room in a carrying tote. Our medicine cabinet and top drawer got a severe editing a few months ago and I feel much better. No expired anything now. No products we thought we’d use but never did. The second drawer of the vanity holds the blow dryer and “lady stuff”. Bottom drawer is travel sized products and refillable travel containers, plus the stockpile of anything that could be needed for the master bathroom or kids bathroom. I used to keep their stuff in their bathroom but I’d lose track of what I already had since I didn’t see it everyday and then over-buy. Now if either bathroom is low on TP, shampoo, toothpaste, soap, or deodorant we all head to that one drawer. I only need to monitor my surplus in one spot instead of multiple storage places. There are somethings in life you never want to run out of. We’re beyond diapers at hour house, but TP and “lady stuff” I keep well ahead of consumption! I keep a healthy stock of lady stuff as well! 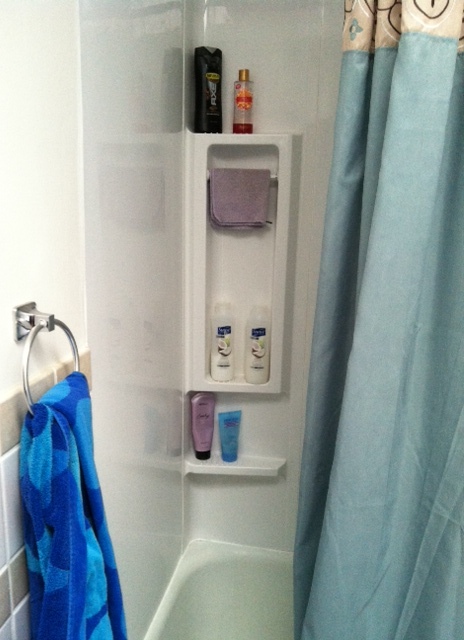 Good job streamlining your “bathroom stuff” so well, that sounds like a great system. I surely will check yours out, thank you for your lovely comment! Note, after poking around your blog: OMG I AM 60K IN DEBT TOO. haha, well it’s comforting to have someone in the same boat ! I always hear people complaining about 20K.. although not great either, it makes me feel worse mine is 3X the size !! I agree so much. I graduated undergrad with 20k in debt and then stuck on another 40 for the M.Ed. I’ve done a fairly similar thing to you- I’ve gone through everything bathroom and makeup related and given or thrown away what I am not going to use up, and put all of the soap, moisturiser that I am going to use up in a box in my bedroom to be worked through. For ‘lady items’ I have a Mooncup and cotton reusuable pads, which has reduced the amount of lady items that I need. So in the shower I have the soap and hair stuff that I currently use; toothbrushes and toothpaste by the sink, a tall thin cupboard with lady items, loo roll, extra toothpaste (I do like to have spares of those things!) and some spray for cleaning. I will probably end up with what I am currently using for shampoo and so on, plus a spare in reserve. A long way to go though, so much soap and moisturise to work through! It took a while to get my bathroom clutter free. Every few months I would go back to see what wasn’t being used and what could be tossed. I gave away my hair straightener because I’m too lazy to do a proper job of it. I’d get bored before it was all straight in back. I use a 2in1 shampoo, which I also use as my soap. For makeup, I just have one of everything I use (e.g. one eyeshadow, one lipstick, etc.). If I’m starting to run low on something, I check a few weeks before to see if it goes on sale. I don’t take any kind of medication (not even aspirin), so I don’t have to worry about that. I guess constantly editing is the way to go until you know what you actually use. I haven’t tossed the hair straightener yet… I do really like it when I actually do a good job of it. Lately though, I just brush it back and put a headband in. I recently got a haircut with bangs, and I got tired of the bangs after about a week. Sigh. Hair drama. Well done and thank you SO MUCH for the pictures! 🙂 i find them so much more inspiring than just words for some reason. I just cleaned and sorted the bathroom at my parents place. My mum is definitely guilty of ‘stocking up’ when things are cheap, but i think she does it to her detriment. I (secretly) threw away 6 bags of rubbish, including one medical cream which expired in 1987!!! There is still so much stuff and a huge shelf in the cupboard of my old bedroom is dedicated to ‘good things to use up before buying more’. There is still way too much stuff for my liking but I achieved my goal of having most of the surfaces clear. I’m hoping that will encourage mum to keep the bathroom cleaner 🙂 last time I stayed the night and had a shower there it was really really dusty and I shared it with a dead cockroach. Hopefully not again! I feel bad invading my parents environment like this, but I really want to help mum and dad overcome their hoarding tendencies, plus make the house more pleasant for me and guests (mum likes to have dinner parties). Anyone else have this problem with a loved one? My mom has a ton of stuff but she is also very VERY RIDICULOUSLY clean. She gets rid of old stuff pretty easily, but she just has so many clothes and shoes and pieces of furniture and decorative stuff. She usually purges it in a yard sale every once in a while. I just can’t get her to stop bringing it in faster than she gets it out. Also – glad you like the pictures! I feel silly taking them but I figure they might help someone see an example! This is my favorite post. I really like how you have decided to not buy something until you run out of it. Also, mom’s 12345435 tubes of toothpaste she got on sale are always available for you. Very true. The dove soap I am using right now is stuff she gave me when I got married. This is perfect…I am currently trying to declutter my home and I am really enjoying how much calmer I am when our closets and drawers are not filled with rarely (if ever) used crap. Great blog!